The solution proposed on this post doesn’t apply only to docker containers but to any service you run in a local private network. By local private network I mean any kind of network that you can only access locally, from your computer, examples of these networks are NAT based VMs, docker network or a private VPN. Docker gives you the power to run the same application image on both development and production environments. To be able to route traffic to a specific container it is common to run a reverse-proxy on ports 80⁄443. Given the hostname the reverse-proxy redirect traffic to the specific docker container. There is famous docker image named nginx-proxy that waits for docker events (container start/stop), modifies nginx configuration and reloads it, enabling you to define virtual hosts on demand. 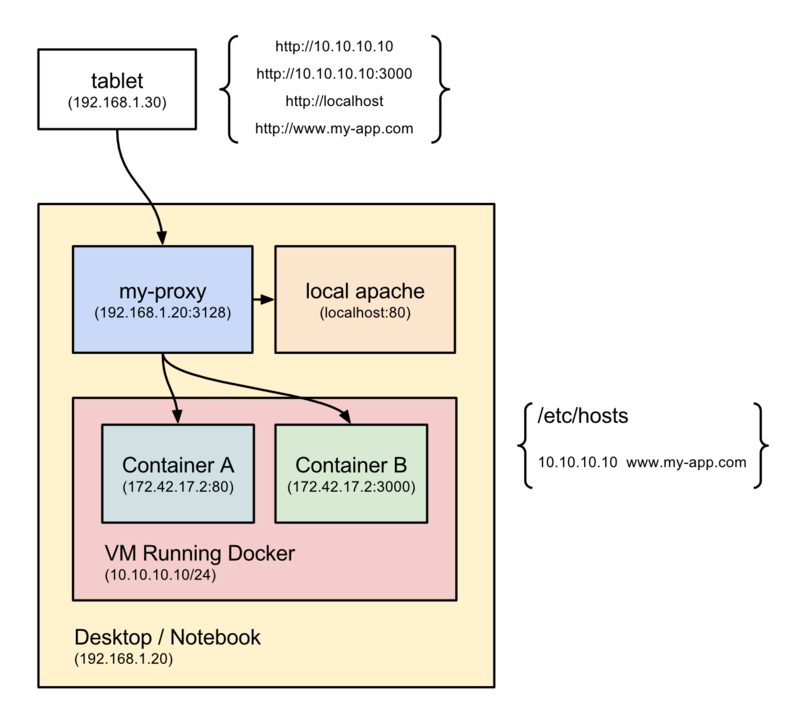 Check its docker image page for more information. The strategy mentioned above works for both production and development environment. On production environment the nginx-proxy docker container will be exposed on ports 80 and 443, mapped to respective ports 80 and 443 of the host machine. In addition to that you must define DNS entries pointing to the host machine. Both solutions work very well. I definitely recommend the first one, you can map an Internet DNS wildcard host pointing to your docker/vm ip address and by doing that you don’t need to manually add a new entry for each new docker container you want to run. At Bravi we take the first option and we have to domain name *.local.bravi.com.br pointing to 10.10.10.10 (the fixed ip address we assign to our Virtual Machine running Docker on it). The easiest solution I’ve found for the problem mentioned above is to run an HTTP(S) proxy on your host machine, by doing this, everything that connects to it will have access to all networks available on your host machine, the naming resolution will also be done by your host machine. In case you setup you mobile phone to use your host’s machine proxy, you will be able to open mobile browser and hit an internal ip address / host, e.g. 10.10.10.10, localhost, etc. You can find more information about it, its architecture and how it works here.